I’m so happy and excited to be joining My Favorite Things today for the MFT & Friends December 2018 Release. All their amazing new products are now available for purchase at MFT Store! Yay! There are a lot of gorgeous stamps and dies that you’re definitely going to love. Today’s card highlights the Over the Moon for Ewe stamp set. I had so much fun playing with it. 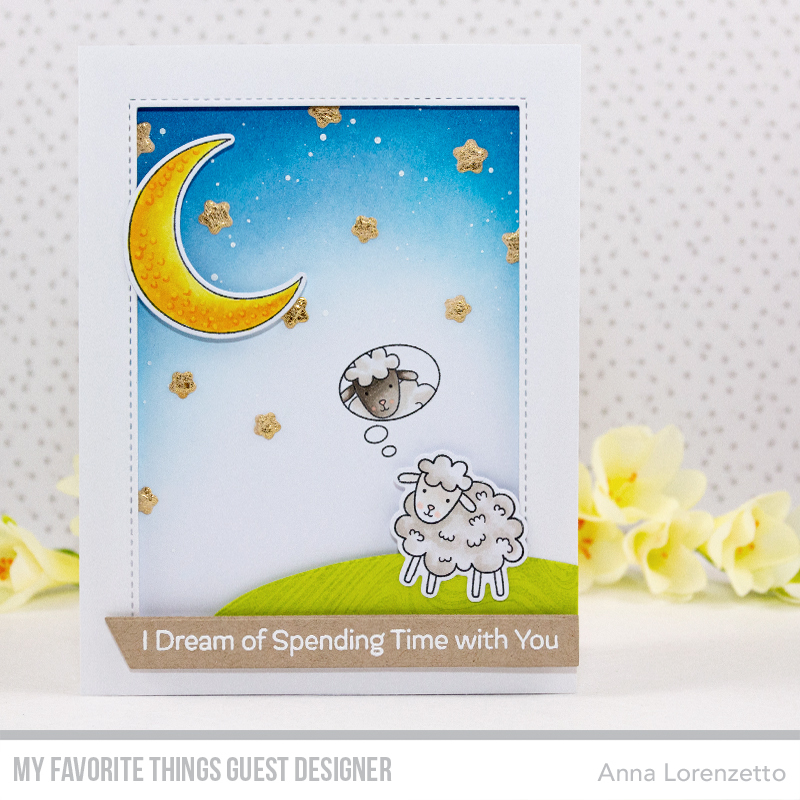 These fluffy sheep are so cute and you can create tons of amazing projects with them, along with the coordinating stamps (included in the set) and Die-namics. I started to work on this card by stamping all the images with black ink and colored them with Copic Markers. When my coloring was done, I cut them out using the coordinating dies. Then, I ink blended the sky with Faded Jeans and Mermaid Lagoon Distress ink directly on my card base and added some white paint splatters on it to create a night sky look. I die-cut a window out of a white cardstock panel using one of the rectangle from the Die-namics Inside & Out Stitched Rectangle STAX. In this way I created a frame for my scene. Next, I die-cut a hill out of green cardstock and stamped the Marble Background on it using clear pigment ink. I really like when a background stamp is so versatile! I think this amazing pattern adds a lovely accent to my project. I heat embossed the sentiment in white on a strip of kraft cardstock previously die-cut using the Die-namics Essential Slanted Sentiment Strips. Finally, I die-cut a bunch of stars out of gold cardstock and used them as embellishment. Don’t forget to check out the MFT blog for more inspirations from the Team and all the MFT Friends! Your comments are appreciated, please visit my IG account (@al_handmade) to share your thoughts on this project.